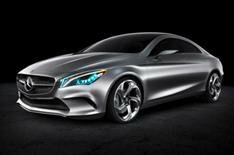 Mercedes Concept Style Coupe unveiled | What Car? The Mercedes-Benz Concept Style Coupe has been revealed ahead of its official debut at the 2012 Beijing motor show next week. A production version - likely to be called CSC or CLA - will go on sale in 2013. The Concept Style Coupe is expected to preview a new model based on the same platform as the new A-Class and B-Class. Mercedes has previously confirmed that this platform will be the basis for a family of five new models; an A-Class 3dr model and a new compact MPV (which rumours suggest will be called GLC) are expected to complete the line-up in 2013. Although the front of the Concept Style Coupe is similar to the new A-Classs, it has a more tapered, sporty shape. Gaping air intakes, bonnet bulges and a diamond-look grille add drama, while the headlamps glow red in standby mode. The Concept Style Coupes profile is very similar to the CLSs, but the surfacing along its sides are a departure one dropping line flows from the headlamps towards the rear doors, while another forms a curve above the rear wheelarches that runs into the rear lights. A third sweeps up from the front wheelarch towards the rear of the car. The overall look is similar to that of the F800 Style concept car that made its debut at the 2010 Geneva motor show, and evidence of Mercedes move towards a more organic design language. Some of the Concept Style Coupes details including the complex light lenses, 21-inch alloys, tiny door mirrors and flush door handles wont make production, but otherwise little is likely to be changed. The interior appears almost production-ready, with a design thats similar to the A-Classs. Only the one-piece seats, carbonfibre trim and neon green details are likely to be altered. The Concept Style Coupe has a 208bhp 2.0-litre petrol engine, dual-clutch transmission and four-wheel drive. This powertrain is expected to be available for the production version, but front-wheel drive models with turbocharged 1.6-litre petrol or 1.8-litre diesel engines are due.